Arizona State University has joined with 14 other institutions in Australia, India, New Zealand and the United States in a radio telescope project that focuses on the early universe and the birth and formation of the first galaxies. The telescope is constructed of 2,048 dipole antennas, grouped into four-by-four arrays called tiles. Each dipole antenna spans about 30 inches (74 centimeters). Most of the tiles (112) scatter across a core section 1 mile (1.5 kilometers) in diameter, with the remaining 16 tiles placed outside the core, yielding baseline distances of about 2 miles (3 kilometers). The antennas and receivers operate at low radio frequencies and are optimized for radio waves in the 80-300 Megahertz range – the same frequencies used for FM radio and broadcast TV. Hence, Murchison's geographic isolation provides great advantages. "A dense-core-plus-outliers arrangement gives sensitive, wide-field views from the central tiles," says Judd Bowman, associate professor of astronomy in the School of Earth and Space Exploration and project scientist for the telescope array. "And the outliers provide high-resolution imaging for solar outbursts and extragalactic sources, other areas of focus in the telescope's scientific program." The telescope program will provide many opportunities for scientists, researchers and students in the school, Bowman says. "As a partner institution in the telescope, any faculty member at ASU can join the project and receive access to observing data." 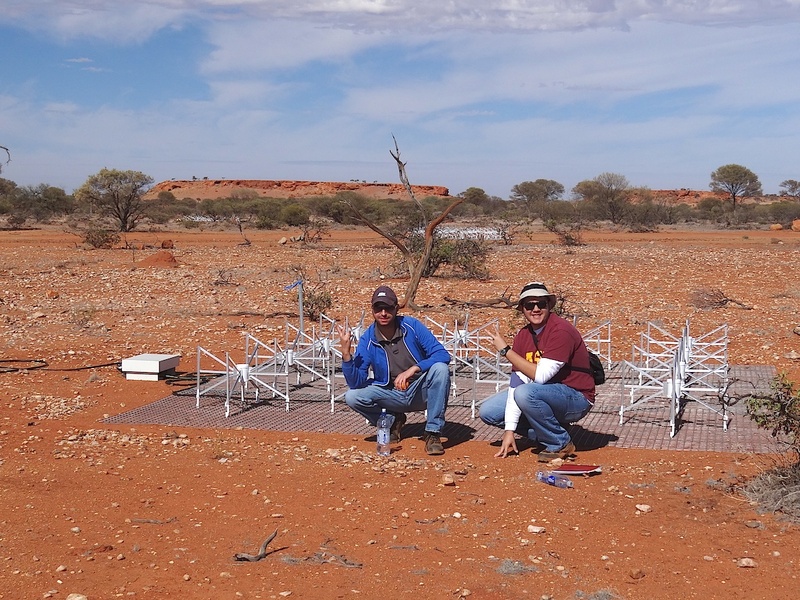 Three ASU undergraduates traveled with Bowman to Australia to help with the construction and commissioning of the telescope and related experiments at the site. The telescope is already being used by graduate students and two postdoctoral scholars at ASU for their research. For example, ASU researchers are currently using the telescope to search for traces of relic radio waves from primordial gas surrounding the first stars and galaxies at a time, more than 13 billion years ago, when the universe was less than a billion years old. The Murchison Widefield Array has four elements, or research avenues, that make up its scientific program. These are: (1) exploration of the Cosmic Dawn and epoch of reionization, the period when the first stars and galaxies formed in the early universe; (2) radio emission from the Milky Way Galaxy and extragalactic sources, which is both a complicating foreground "fog" for observations and an interesting scientific target of its own; (3) searching for transient and variable radio events that are rare and faint, and which occur on timescales from seconds to months; and (4) space weather, the study of solar outbursts as they travel from the sun's surface to Earth. Along with ASU's new role in the project, Bowman notes, the School of Earth and Space Exploration is hosting an international scientific conference in December 2014. It will be based around the Murchison Widefield Array and the initial science results from both it and other low-frequency radio telescopes. The annual Bookstore Faculty/Staff appreciation event is set to take place Dec. 3-4 at all four Sun Devil Campus Stores, as well as the new Sun Devil Marketplace. The annual Bookstore Faculty/Staff appreciation event is set to take place Dec. 3-4 at all four Sun Devil Campus Stores, as well as the new Sun Devil Marketplace located at 660 S. College Avenue. Additionally, there will be a special one-day sale on all Apple, Dell and Samsung computers on Dec. 4, when faculty and staff are eligible to receive an additional 8 percent discount on top of their educational discount. The discount is on in-stock merchandise so no-cost reservations are highly recommended. For more information, visit sundevilbookstores.com and see the FAQ sheet. Sun Devil Marketplace will be open late until 8 p.m.